I have a fluctuating relationship with London Fashion Week. I began attending when I was 15, the landscape of Somerset House an altogether different terrain with a handful of street style snappers and a press lounge that welcomed bloggers. All of this has changed, for various - and very understandable - reasons. Blogging, press, social media, the industry. All these areas (and each in relation to the others) have been shifting and re-moulding what is valued; where the focus lies. I am drawn back - dropping in to the odd show, catching up with old faces, meeting new ones. But as each six months rolls by, season on season, I’ve been a little less involved. That's not to say that there aren't designers who make my heart sing (and my potential purse strings tremble) - but I’m happy to remain at more of a remove than previously. Yet, this time, there’s a difference. Come Saturday Sept 13th, I’ll be taking part in a shoot with a twist. Titled ‘Charity Fashion Live’, it’s going to be located in my most favourite of venues – a charity shop (a Red Cross, to be specific). Emma of Back of the Wardrobe will be conjuring up a second hand styling storm – emulating outfits from the shows held that day, using just what she can find on the rails. The fab photographer Claire Pepper (who I’ve worked with previously on this Charlotte Taylor shoot) will be there to capture these spontaneous creations on camera, while Darren O’Mahoney will be producing a film. It’ll be a day of snap decisions and social media, with all the looks broadcast online in as quick a turnaround as can be managed. Afterwards the outfits will be auctioned on eBay in aid of The British Red Cross. I’m one of two models for the day. Although it’s usual to have no idea in advance how one might be dressed on a shoot, it’s a little more unusual for the rest of the team to be equally in the dark… The element of unpredictability makes it a hugely exciting prospect though. It weaves together so many of my interests, from second hand sustainability to innovative creation. The ethos chimes strongly with my own, relying on promotion of the longevity of clothing – and the creative possibilities to be found on a budget. 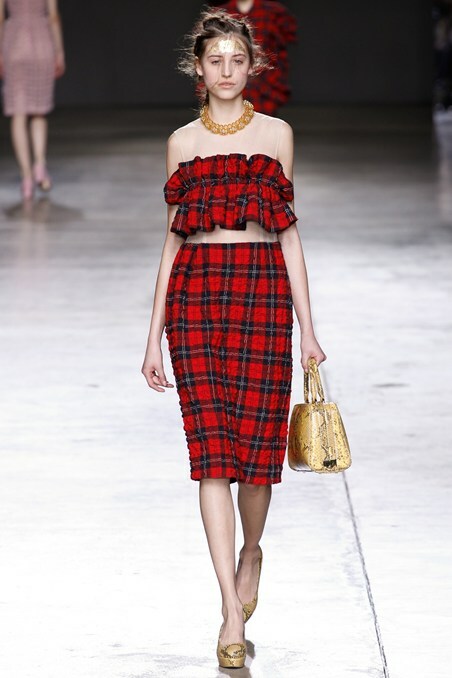 In preparation, I had a little go myself, with help from my mum – choosing a look from Simone Rocha’s AW14/15 collection: see image above left (photo credit Vogue.co.uk). 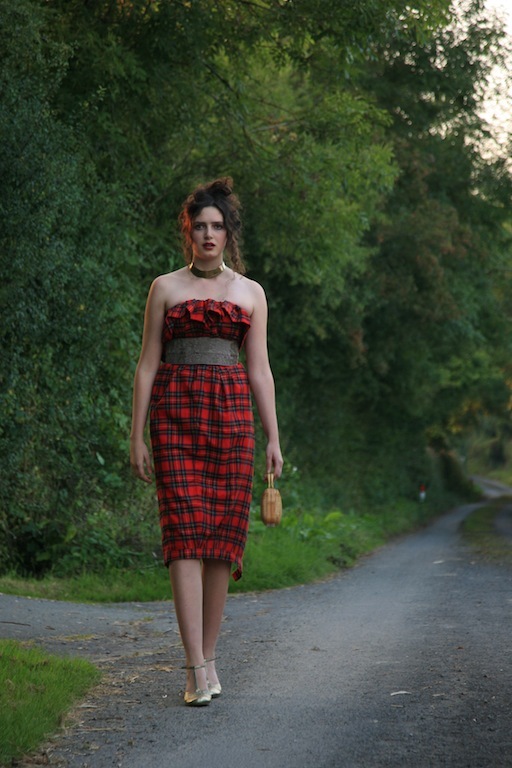 My DIY version is composed from a long tartan skirt (bought from a charity jumble sale) that was turned upside down and transformed into a strapless dress with the help of ribbon and belts. It was ribbon-tied just above the bust with enough fabric from the hem pulled over to form the ruffles cascading over the top. Then it was belted with a cummerbund (you can see the detail behind). The open zip even forms a slit at the back! All the accessories were sourced in charity shops over the years too. Although I might not be able to get away with it on the catwalk, it seemed curiously appropriate for striding around country lanes. Interestingly, I’ve actually used this skirt before for some other recreations of my own, including this homage to Corrie Nielsen several years back. It’s amazing how often the contents of my own wardrobe/ dressing up box can yield items suddenly deemed ever so ‘on trend’ or ‘of the moment’. You can follow the fun on Saturday on Twitter - with @Backofwardrobe using the hashtag #charityfashionlive. I'm sure it will be making plenty of appearances on my twitter too, which you can follow at @RosalindJana. Images below are from previous years. I can't wait to see what happens..
LFW normally holds absolutely no interest to me but the Saturday charity shop show sounds utterly brilliant. This sounds really amazing and exciting! It must be great to watch the process! Such a good idea! Was planning to go charity shopping soon and this has persuaded me even more. Excited to see what you come up with at LFW. Goodness me! What a fabulous creation. I am so impressed! Slap me if you want. But, there is something elegantly Masai about this outfit too. So I love it all the more! The adrenaline of not knowing is what makes me so excited about your event. BAM! Haha. I hope you have too much fun. This is a fantastic idea. The recreation of the runway look, with help from your mum, is spot on. I'm amazed by many things in this post. The way you managed to make your own couture dress out of something that was in your closet being one of them! I swear that first moment, I though it was the same dress! Another thing I really like is the photography...something very sincere and natural about it. I never attended a fashion week and cannot know what it is like...but it is something that was always of some interest to me. I enjoyed those few fashion shows I visited (always on the invitation of a designer and usually with a charitable purpose, never in any way connected with the fashion week). I wouldn't like to visit a fashion week someday...I usually do follow the shows from various fashion weeks on internet. This year however I just have no energy for it. I think my brain capacity to process anything is endangered by the amount of studying and working I've been doing lately. It really does not bother me right now not to be a part of it (at least in the passive way, by observing it). Someday I might or might not try to attend a fashion week, but right now I'm not thinking about it too much. So I think I know what you mean when you say you prefer your position now- in life you sometimes have to give up one interest for another and that is completely natural. Finally, I do like this initiative and the reasons behind it. I also love the other ladies you have included- they all look fabulous! I actually do miss going to LFW sometimes for work. The charity show would be brilliant. I also like your interpretation of the runway look very much. I used to go to LFW but over the years I've realised I don't really miss being there. Of course, I'll drop by to see old friends when I'm in town. Anyway - I love, love your recreation, it looks quite incredible! Hard to believe that compared to the Simone Rocha dress, yours is a charity skirt creation. It's amazing! This looks really cool. I respect the spontaneity of it. Hope you really enjoy it! Absolutely dazzling! I love how you re-created that runway look so well. It really looks fabulous on you, more so even. It's so good that you're using your styling and fashionista skills for a great cause. Anyway, I hope the event went well. Thank you so much for sharing those gorgeous pictures! Stay beautiful, Rosalind!